Specifications: Wattmeter relay: 0 to 100W in four steps : 0 to 10mW-1W-10W-100W & signal can be attenuated up to 40dB. In four steps of 0-10-20-30- 40dB. & Load that can be given to a audio & radio signal is from range 3 ohm to 10K ohm in ten steps i.e. 3.6, 8, 16, 50, 78, 600, 1K, 2K, 5K & 10K ohm. Customers can avail a wide gamut of Power Factor Meters, which is highly valued in the national and international market. Our meters are manufactured using high grade raw material procured from reliable vendors. This meter offers long service life and is manufactured to offer accurate results. These are stringently tested on various testing parameters to ensure the quality and durability. - Lag and Lead indication. 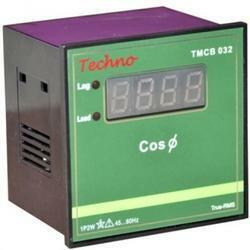 Being a most reliable organization, we are engaged in offering a wide range of Power Digital Meters. Matching to the huge market demands, we are involved in providing Power Meter.